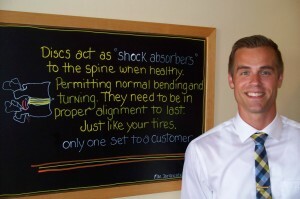 Growing up with his father (Dr. Randal) being a chiropractor, Dr. Levi felt that chiropractic care was just a normal part of everyday life. A big fan of basketball, he played all the way through undergrad at Trinity International University, Deerfield, IL from 2004-2008, made his personal goal of 1,000+pt during his career in the CCAC conference. Then, during his sophomore year, he was staring at a nerve chart hanging up in his dorm room and decided then that he was going to become a chiropractor and enrolled at Palmer 2008-2012. “I see my dad and how much he enjoys his work… and to do something you love every day is awesome.” That’s when Dr. Levi called Palmer College of Chiropractic to begin the enrollment process. Palmer college offered top education with a vigorous academic schedule, He looked forward to the challenge of educating patients what chiropractic care can do for them and the complex reasoning why it works. The study and science of Chiropractic can be applied to vast issue’s regarding a lot of patient problems and health concerns, stimulating the nerve and removing interference allow the body to function properly. Outside of the office, Dr. Levi is a committed father and husband, his lovely wife Kathleen, also a doctor of chiropractic, owner of “Door county healing center” located on 2nd ave, Sturgeon Bay. He has four children, a son Trigg ,daughter Lotte Lu, son Macklin and Reggie, there is not a dull moment in the Arnold house hold. Dr. Levi is WIAA licensed official for all levels of basketball the last 5 years, plays basketball and enjoys working out in his spare time. Spending time with his family is a priority outside the office, they embrace the sunshine on family walks and bike rides, striving to stay active together. His family attends the Sturgeon Bay Community Church.